Monumental painting flourished in Greek territories during the post-Byzantine period (1453 AD – early 19th century) despite the Ottoman dominance. Craftsmen working in this framework employed gilding in order to highlight specific pictorial elements (e.g. halos). Pertinent microsamples have been studied by means of several analytical techniques in the past, yet the relevant studies have mostly focused on the organic adhesives and, thus, the leaves themselves have been largely overlooked. The current study focuses on the investigation of the gold leaves, both in terms of micromorphology and composition. 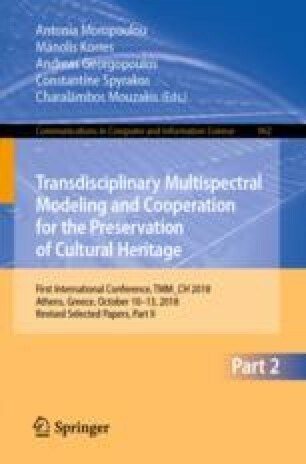 Samples from several post-Byzantine monuments of Epirus territory (NW Greece) were studied by employing techniques such as Optical Microscopy (OM), Scanning Electron Microscopy coupled with Energy Dispersive X-Ray Analyzer (SEM-EDX) and micro X-Ray Fluorescence (μ-XRF). A novel application of the latter technique allows for an estimation of the leaf thickness and pertinent data are compared with the results of the direct SEM thickness determination. Analytical data were evaluated in the light of a recent study that focused on the gildings of contemporary Greek portable paintings. It was thus established that post-Byzantine craftsmen were using the same gold leaves, regardless of the nature of the substrate (wall or panel). Moreover, the studied leaves turned to be of enhanced purity and reduced thickness in comparison to those found in contemporary Western European paintings. This research was completed as a result of support from a Greek State Scholarships Foundation (IKY) scholarship program; the work was co-financed by the European Union (European Social Fund-ESF) and Greek national funds through the action entitled “Reinforcement of Postdoctoral Researchers”, in the framework of the Operational Program “Human Resources Development Program, Education and Lifelong Learning” of the National Strategic Reference Framework (NSRF) 2014–2020 (grant number: 2016-050-0503-7689). Dr. V. Papadopoulou and Dr. K. Soueref, directors of the Arta and Ioannina Ephorates of Antiquities respectively, are sincerely thanked for their support. The personnel of the Ioannina Ephorate of Antiquities and especially the archaeologists P. Dimitrakopoulou, E. Katerini and D. Rapti, along with the conservation personnel are also thanked for their help during sampling. Special thanks are due to the General Directorate for the Restoration, Museums and Technical Works and the Directorate for Byzantine and Post-Byzantine Antiquities (both divisions of the Greek Ministry of Culture and Sports) for sampling permissions.